Many injured workers asked the question, why hire a work comp lawyer? There are benefits of hiring a workers compensation attorney. You should choose wisely as hiring the wrong lawyer can be devastating to the outcome of your case. If it’s an out of town lawyer, if the an advertisement that does not give you the name of the lawyer and the address, or if that lawyer ad claims to be the “best”, it is probably a bad move. There are hundreds of inexperienced lawyers and out-of-town lawyers advertising with stuffed professional written reviews on the Internet. Call Cleveland & Metz, there is no substitute for experience. Our review history goes back over 10 years. If you see a law firm on the Internet with dozens of reviews that all went up in the last couple of years, they’re probably fake. So choose wisely. Our consultations are free and if you don’t need a workers compensation attorney we will give you an honest assessment of your case. How to spot fake attorney reviews from AVVO, click here. The insurance company will have a defense work injury attorney assigned to defend them against you and your claim. Their workers compensation adjusters and defense lawyers are highly experienced and will generally run circles around you. Hire an experienced local worker compensation lawyer near you who only represents injured workers who can make sure you are being treated fairly and receive the work comp benefits and rights you deserve if you have been injured on the job. A local and experienced workers compensation attorney can assist you with selecting the right work injury doctor, negotiate with the insurance company and represent you in court. Most workers compensation cases settle before trial, and an experienced work injury attorney can get you the ettlement you deserve. If your case goes go to trial, you are going to want a workers compensation attorney familiar with that court with years of workers compensation trial experience. Hiring an experienced workers compensation attorney is cheap. A personal injury attorney will charge anywhere from 33% to 50% of your final accident settlement. Worker’s Compensation lawyers generally work for a 15% fee of your final work comp settlement. If you’re workers compensation claim is denied, a work injury attorney can likely help you. A reputable and local workers compensation lawyer will be familiar with your regional Workers Compensation Appeals Board and their judges.The work injury lawyer will save you from the paperwork nightmare which is part of the workers compensation system. You will no longer have to deal withtheinsurance company as your work injury attorney will take over that task for you. You will not have to deal with work comp carrier any longer. If you have suffered a work injury, you already have enough to worry about. Your work injury lawyer can also help you obtain benefits if you are unable to work as a result of your work comp injury. Hiring the right local experienced Worker’s Compensation attorney, preferably a a certified specialist in Worker’s Compensation law with the California State Bar, can help you navigate your workers compensation case from beginning to end for the best possible outcome for you. 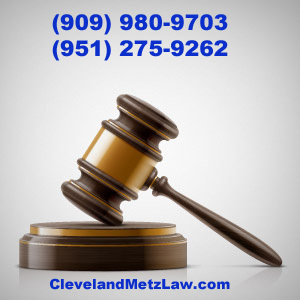 Cleveland & Metz serves for the last 22 years only the eastern Los Angeles County area, San Bernardino County and Riverside counties. We do not advertise all over the state and focus on representing injured workers locally. 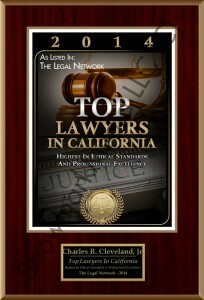 Unfortunately many residents of the inland Empire are saturated with fake Internet advertising from out-of-town attorneys or inexperienced lawyers who advertise heavily here and wind up with attorneys in Long Beach, Los Angeles or Orange County who do not give them personal attention that the work injury case deserves. Most of these injured workers And many of these people will never ever meet their actual attorney. If you see an attorney advertisement, look up the attorney’s information at the California State Bar to find out where the attorney is actually located when making your decision. I would recommend you stay away from lawyer groups with anonymous or mysterious names like “California super lawyers, legal defenders, injury lawyers group,” and other names that do not identify the attorney and make vague claims that they will fight for you. You have no idea what lawyer you’re going to wind up with. This information and the links below should help you make an informed decision as to which attorney is best for your case. Benefits of hiring a work injury lawyer. We are a local law firm serving the inland Empire for the past 22 years focusing on injured workers living in the communities of Rancho Cucamonga, Pomona, Montclair, Ontario, Fontana, Rialto, Colton, Bloomington, San Bernardino, Highland, Eastvale, Jurupa Valley, Riverside, Moreno Valley and all of the communities in the west end of Riverside and San Bernardino counties.